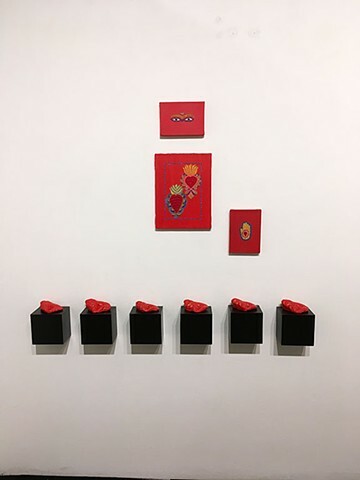 Body & Soul is a mixed media installation in a group exhibition called "She Is..." at One Art Space in New York City, celebrating Women's History Month in March, 2018. I installed Sacred Eyes, Sacred Hearts, Sacred Hands and Six of Hearts. My work was reviewed online--the knockturnal.com by Jinny Choi who wrote, "Chiang contributes to the notion that womanhood is not a single, universal experience but rather, a collection of distinct experiences."